Bearish doji star pattern is a trend reversal sign that consists of two elements. The first day is a long white candlestick, that is formed in an uptrend. The following day is a doji, with small shadows. The doji gaps up, the volume of trading is low. The most important criteria are the prevailing uptrend and that the doji’s body is located above the previous candle’s body. The appearance of bearish doji star should be confirmed on the following candles. If the doji in the pattern shaped like an umbrella, the pattern is called “bearish dragonfly doji”. In case you see an inverted umbrella, it is called “bearish gravestone doji”. 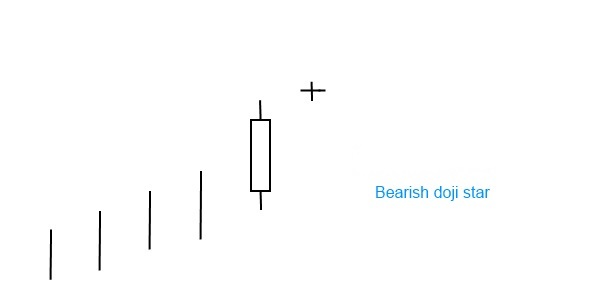 Such as most of the candlestick patterns bearish doji star has its bullish counterpart: bullish doji star.